These are all the Blogs posted in October, 2012. We pulled the anchor and were underway from Solomons at 0755 hours. It was very foggy and overcast as we left the harbor this morning… There were a few boats out and headed south and there was a lot of chatter on the VHF radio between them about where they were going all going to seek shelter from “Sandy”… the hurricane headed this direction. We had plans to attend an MTOA regional event being held this weekend at Olversen’s Lodge Creek Marina, Lottsburg, VA. So we did not have far to travel today and we would be holding up at Olversen’s Marina until after “Sandy” had passed. 1-2 seas for most of trip down the Chesapeake Bay and they diminished to less than 1 foot when we turned into the Potomac River. The sun was came out as we headed up the Potomac and it turned into a beautiful day. We arrived at approximately 1300 hours and docked at Olversen’s Marina… E-Dock. Fred Olversen said this would be the best dock for us since he had just put in some new pilings on the dock. We are located at N37°59.728’, W076°32.457’. We doubled up the dock lines and put out the BIG fenders for “Sandy”. We will stay here until after the storm passes. We traveled today for 5 hours and 5 minutes covering 35.53 nautical miles averaging 6.99 knots. Last night we discovered that one of Vacuflush head pumps was not working… so rather than fix it last night I opted to wait till today… so was not eager to jump out of bed and dig into the “pooper” pump. Anyway, I changed out a couple of duckbills valves and the head was good to go. We departed from Galesville, MD at approximately 0920 hours. It was a calm day but very foggy… nothing like Block Island fog as we still had a mile of visibility. Ran down the Chesapeake Bay with little to effect from current… so we did not beeak any speed records juts a steady 6.5 – 7.0 knots all day. We could hear a lot of boat traffic on the VHF radio but with the fog we did not see too many other boats at all today… we did see a small fishing ship and a small passenger ship passing each other off our starboard side but not much else. The fog did eventually burn off at the end of today’s trip and we did see a lot of boats fishing.. both commercial crabbers and recreational. We decided to stop early today and venture into the Solomons… we have been in here before and it is easy in and out. Never anchored before… we have always docked here so this will be a little different. 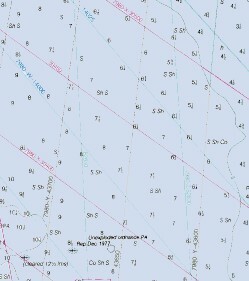 We arrived at approximately 1530 hours and anchored at N38°19.268’, W076°27.343 in the first small basin to port. We are surrounded by 3-4 marinas and a small island off our bow. There’s a Tiki Bar and dock 150 feet from us… according to the cruising guides they allow you to dock your dinghy and are pet friendly so we will be visiting them come happy hour. We traveled today for 6 hours and 20 minutes covering 41.07 nautical miles averaging 6.49 knots. Yesterday after we arrived we were greeted by Jeff Tuer. He is a captain for the local TowBoatUS affiliate here in Chesapeake City. We had become friends on Facebook and he knew we were arriving and he stopped to visit. We spent several hours together with Jeff and his wife and had an awesome evening with them. We departed from Chesapeake City at approximately 0700 hours just as the tide was switching from flood to ebb. Our destination for the day was Galesville, MD off the West River south of Annapolis. MD. We have stopped here several times and find it to be a good stop for the night. Weather for the day was totally as predicted… less than 1 foot seas… most of the day it was flat calm and the ebb tide gave us a boost of speed for most of the day… 8 knots plus… it was great… but it can’t last forever and a hour or so before arriving in Galesville we started to experience a little current on our bow and slowed slightly. Nothing out of the ordinary happened today… several boats passed us going north as south… most seemed like locals rather than cruiser heading south. Overall it was an awesome day of cruising. We arrived to Galesville, MD at approximately 1500 hours and docked at the city docks which between Pirates Cove and Thursday’s Restaurant. Our location is N38°50.54’, W076°32.347. We traveled today for 8 hours covering 56.77 nautical miles averaging 7.1 knots.